Astro Navigation In A Nutshell Part 2. Suppose we are in a yacht and we measure the altitude of the Sun and find it to be 35o; what does this tell us? All that we know is that the yacht lies somewhere on the circumference of a circle centred at the geographical position of the Sun. Such a circle is known as a ‘position circle’ since our position is known to lie somewhere on its circumference. 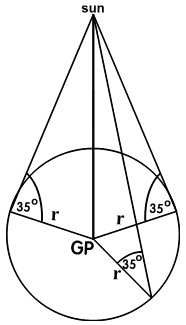 The diagram shows that, at any point on the circumference of the circle, the Sun’s altitude will be 35o and our distance from the GP will be equal to the radius of the circle. The problem is to establish at which precise point on the position circle the yacht lays. At first, it might seem that all we need to do is to observe the bearing of the Sun at the same time that we measure its altitude and then draw the line of bearing on the chart along with the position circle. In this way, it would seem that our true position would correspond to the intersection of these lines on the chart. However, building on the work covered in Part One, we will find that there is a problem with this idea which makes it impracticable. Because of the great distance of the Sun from the Earth, the radius of the position circle will be very large (approximately 3000 nautical miles or so). A chart on which such a large circle could be drawn would require such a small scale that accurate position-fixing would be impracticable. However there is another way of solving the problem. We cannot physically measure the distance from the yacht to the GP but we can measure the altitude of the Sun at the true position and from that we can calculate the zenith distance as can be explained with the diagram below. ZX is the zenith distance and AU is equal to the angular distance ZX in nautical miles. So, measuring the altitude gives us a method of calculating the zenith distance and the zenith distance gives us the distance AU in nautical miles. The Intercept. Our aim is to calculate the azimuth and altitude of a celestial body from our DR position at the time that we accurately measure the altitude at the true position. The azimuth will give us a line of direction between the DR position of the yacht and the geographical position of the celestial body. (We use the azimuth rather than the compass bearing because a magnetic compass is not very accurate whereas the azimuth can be accurately calculated. 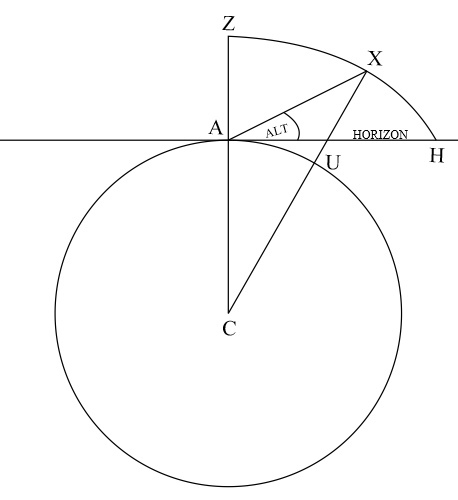 By finding the difference between the two altitudes and hence the difference between their zenith distances, we can calculate the intercept which is the distance from the DR position to the circumference of the true position’s position-circle. Astronomical Position Line. We draw the position line at a point where the intercept intersects with the position circle. Since the circumference of a circle at any point is at right-angles to the radius at that point, no accuracy will be lost by drawing the position line as a straight line at right-angles to the intercept. The navigator will then be able to draw a short, straight line on the chart along which he knows his position lies; such a line is known as an astronomical position line. In celestial navigation, just as in coastal navigation, we need to calculate the intersection of three or more position lines in order to obtain a position fix (or observed position as it is called in celestial navigation). Many thanks to Jeremy Parker for his help in updating this page. This entry was posted in astro navigation, Astro Navigation Demystified, Astro Navigation Topics, astronomy, celestial navigation, Marine Navigation and tagged astro navigation, astronomy, celestial navigation, celestial navigation training, mathematics of astro navigation, navigation. Bookmark the permalink.